I was looking forward to working outside, maybe doing some weeding in both my garden and EJ’s garden. When I opened the door to go outside this morning, however, I was very surprised to see that it was raining. It was not a heavy raining that makes a musical drumbeat on the roof. Instead, it was a silent misty downpour. No working outside today. Even though it is only July, the weather feels very much like autumn. It’s hard to believe it’s not September or early October. The temperature reached only a cool 63 and it rained off and on with scattered showers all day. The dark clouds were dramatic with occasional blue sky poking through. EJ and I absolutely loved it. The coolness made me feel like working. However, since I couldn’t work outside, I had to find something to do inside. 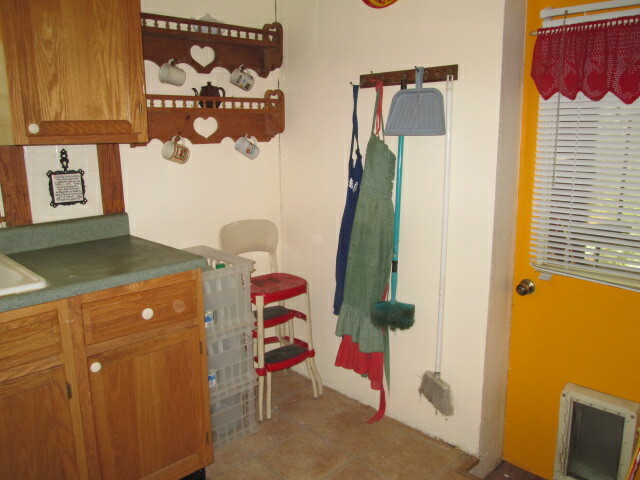 There was clutter because EJ had taken down the shelves last Monday in order to paint the kitchen. I thought a good project would be to paint. Since I knew that EJ’s back and shoulder were really hurting him (he suffers greatly from a bad back), I offered to finish the job for him. He said he really wanted to do it himself. I love the way EJ and I work on our house. I don’t know of any couple who decorates as we do: We always allow the one who has a vision for the way a room could look to have creative control of that room. The other one might give advice and help with the project, but the one with the vision makes the final decisions of color and style. This requires trust. We aren’t always sure of the other’s decorating choices at first and it’s always a risk to let the other have control. However, we’ve learned it’s also kind of fun to say, “It’s your decision….” and then see what the other does. I had creative control of the master bedroom and downstairs bathroom when we worked on them a few years ago. I love the Tuscany style and was going for that sort of feel. EJ wasn’t sure he liked the gold, maroon, and touch of green in the master bedroom at first. As he saw the room take shape, he changed his mind and soon really liked the room. He kept asking “Are you sure?” when I chose to paint the downstairs bathroom a sort of mustardy brownish color, but now he agrees it’s very nice and the perfect color. EJ wanted creative control of the kitchen. He’s done a lot of work on it over the last few years, completely changing the feel of the room. I almost shuddered when I saw him open the can of school bus yellow paint and begin painting the kitchen door a couple of years ago–but he has creative control of the room so I said nothing. After the initial shock, I quickly grew to love the yellow door. It is, after all, my favorite color, and I think it adds a note of brightness and warm cheerfulness to the room, which is very welcome on a gloomy day. We always say in response to the other’s uncertainty: “I have the vision for this room, trust me, this is going to look GREAT!” We always end up loving how a room turns out. So this is why EJ wanted to paint the kitchen himself. It’s his project. He painted the whole kitchen today, hung the shelves, and did a variety of little jobs. 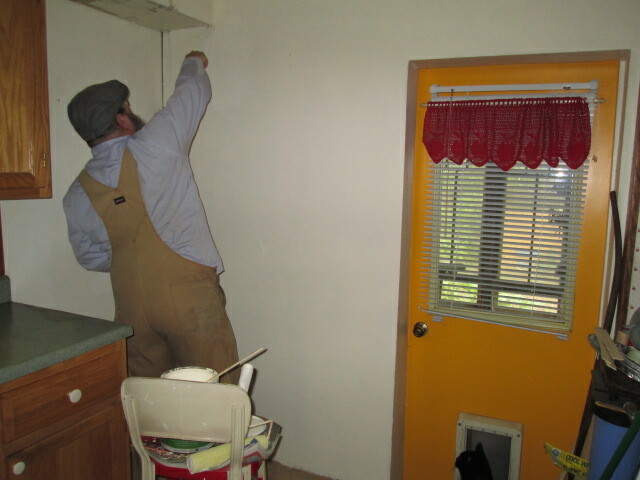 He still has to paint the trim, but that is a job for another day. While EJ worked, I kept him company and helped him as needed. I also did several small jobs, like grind our whole bean coffee, washed the cabinets, and so forth. As we worked, we enjoyed chatting. We love to spend time with each other.